One-line review: X Marks The Spot. Spot On!! Short review: This short book, over the short space of 250 pages, covers thirty different topics, grouped into six sections, and is lucid, simple, and yet engaging enough to make you want to learn, re-learn math. Even better, if this book makes you want to bring across the magic of math to children, yours or any, then that is surely worth something, isn't it? The book's success lies in the fact that it successfully treads the middle path between the two extremes that many other books tend to fall into - either picking one topic and getting so technical as to lose the reader somewhere between page 10 and 15, or so unsure of the reader's interest in math as to not talk about math itself and get bogged down with the personalities of math. The early chapters in the book, that talk about topics as simple as addition for example, still bring out something of the magic of maths where using a simple diagram, we can bring out the obviousness of the commutativeness of multiplication (7 x 3 = 3 x 7, no really!) Even when the book gets into more advanced topics, such as Mobius strips ("Twist and Shout"), the lucidity of the narrative doesn't take a hit. Each chapter is on average about eight pages long, and liberally sprinkled with charts, diagrams, illustrations, and a dash of humour. True to the title, this book succeeds in its endeavour to bring out the magic, the joy of math. Onwards to more books on maths, then! Long Review: Say the word Math and a shudder, a frisson goes through most people. It conjures up traumatic childhood memories buried for long in a deep recess of the mind. For most of us. We wear our math phobia as a badge of honour ("I'm just not geek enough", or more derisively as "I've got a life, you know"). As adults if we do take another crack at the magic of maths, it's usually by resorting to (good) books such as "The Man Who Knew Infinity" or "Journey Through Genius" - biographies of great mathematicians, or "Secrets of Mental Maths" - fun books on math tricks and tips, or "The Number Devil" - a book to get children to think about math in a fun way, or "Innumeracy" or "How To Lie with Statistics" - books that try to shame and then educate us on the basics math literacy. Then there are books for the more-than-the-casual reader like "Infinity and the Mind", "An Imaginary Tale: The Story of [the Square Root of Minus One]", e: The Story of a Number, and "An Imaginary Tale: The Story of [the Square Root of Minus One]" (chapter 8 of "The Joy of x", "Finding Your Roots" briefly dwells on this strange number, alphabet, err - let's just be techno-babbly-brilliant and call it big unstructured data, which after all is a mix of numbers and data, isn't it?) - books that focus on a single topic or area and soon enough many of us are lost beyond chapter two, a fate that Stephen Hawking bemoaned befell even his blockbuster bestseller, "A Brief History of Time: Stephen Hawking". This book, "The Joy of x", is then a true joy, not just of "a" but all the way to "z" of math and beyond, to the realm of imaginary numbers and curved spaces and more. What began as a series of short articles on Math (The Elements of Math) the author, Steven Strogatz, wrote for the New York Times in 2010, is now a full book that (almost) covers the whole gamut of the world of mathematics, starting off with the gentlest of introductions - fishes and Sesame Street. Yes, few will dispute the simplicity of such a setting. The chapters in this first section, titled "Numbers" expectedly cover such sweet and simple topics as addition, subtraction, the place-value, commutative laws, division, and multiplication. The Babylonians had the idea of using a number system based on 60 - "an exceptionally pleasant number", but it was the Hindu-Arabic number system that gave the world not only the modern decimal number system, but a placeholder for zero. The next five sections, "Relationships" - algebra and quadratic equations, "Shapes" - geometry, parabolas and ellipses (it is really a fascinating chapter, with the simplest of explanations to explain the difference and similarity between parabolas and ellipses) and the introduction to calculus, which is covered in the next section, "Change". Section five is "Data", and covers probability, statistics, and a gentle introduction to Google and liner algebra. The last section, appropriately titled "Frontiers", takes a look at some of the recent and emerging areas of maths, including prime numbers, group theory, and the mind bending reality of infinite series, partial sums, and the like. Even as the topics gradually descend (or ascend, based on your perspective) the slope of simplicity, the language stays simple. The math is kept to a minimum. Most importantly, neither the lucidity nor the tone changes, surely a challenge when covering a range of topics as diverse as simple addition and differential geometry. A dash of humour keeps pace with the book, and so when the author writes about the time he spoke at his daughter's elementary school first-grade class about his profession, and chose the topic of Mobius strips ("Twist and Shout"), one little boy had a "meltdown" when he realized that he couldn't get his crayon back to the starting point, no matter how many times he tried. "An apparently, my lesson wasn't the first to have driven a student to tears." 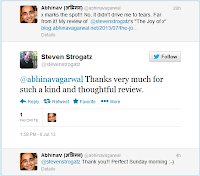 Update (July 7, 2013): Steven Strgatz kindly enough tweeted a thanks for my review. @abhinavagarwal Thanks very much for such a kind and thoughtful review.